Μy name is George Kalidaropoulos and I was born in Thessaloniki in June 1956. I studied Mechanical Engineering at the Polytechnic School of Aristoteles University of Thessaloniki. My career had led me to work in several areas and projects during the years and I didn’t spend time on art in particular. The sea has always captivated me – during all types of weather and seasons. I created my first “ship” with a knife on a hot summer afternoon finding some driftwood, more to pass the time than to actually create something. Later I added cloth. Unfortunately or fortunately this first boat I gave to a friend of me (actually she took it) and this led to me then creating a second and then a third one and so on. 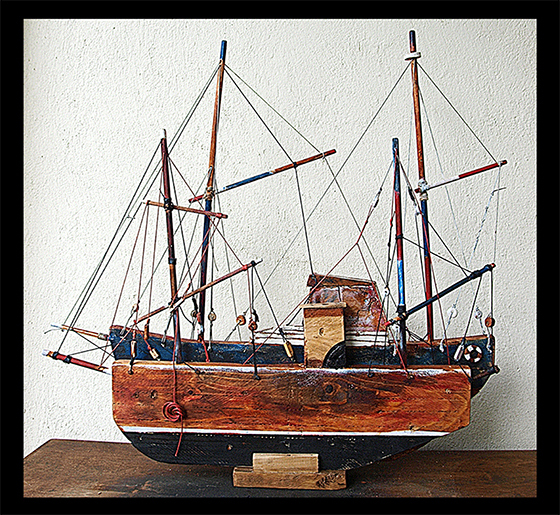 Lately I’ve been creating wooden forms of boats, fish, birds – sometimes designed on paper or on computer and sometimes spontaneously arising and taking form from the materials used. Materials used are driftwood, wood from pallets, planks, metal, sheets, pipes, wires, slats, nails, waxed threads, nets, acrylic colors…. Ονομάζομαι Γιώργος Καλιδαρόπουλος και γεννήθηκα στη Θεσσαλονίκη τον Ιούνιο του 1956. Σπούδασα Μηχανολόγος Μηχανικός στην Πολυτεχνική σχολή του Α.Π.Θ. Στη συνέχεια ασχολήθηκα με διάφορες ετερόκλητες δραστηριότητες. Με την τέχνη δεν ασχολήθηκα ιδιαίτερα. Η θάλασσα μου άρεσε πάντοτε, όλες τις εποχές του χρόνου. Παράλληλα ασχολούμαι με τη φωτογραφία.